This project was proposed by a Ugandan associate of the school, which is situated about 10 miles or so from Rukungiri. The water supply was pumped from a protected spring source to a single tapstand at the school, but was intermittent and unreliable. This meant that the staff and their families (27) and pupils (396), together with 150 or so beneficiaries in the surrounding community, had to resort to collecting water from pools formed by pits from which clay has been excavated for the purpose of brick-making. Sanitation at the school and in the surrounding community was also in poor condition and over-full, and at the school was seriously under capacity – for example, for girls there is only one toilet for 40 pupils. A survey by the WATSAN team thus confirmed the urgent need for intervention at this school. Two 30m3 rainwater catchment tanks were constructed to collect water from the school roof and from the roof of the adjacent church. Two pit latrines, each with six stances, were built for the pupils, and a two-stance latrine with a urinal for use by the staff. Support was provided for the provision of bath shelters, dish drying racks and tippy taps, and a community compost pit at the school and in the community, all in association with a health and hygiene education programme. Thanks to funds raised by the UK and Chinese Walks for Water, a substantial pledge from a loyal supporter in the UK, and in particular the fundraising efforts of participants in the St. Peter’s, Bishops Waltham Tour in August 2017, this project was commissioned in a formal ceremony during the St Peter’s visit. International development charity Compassion International runs three child development centres in the villages of Rwerere, Katurika and Burama. These centres cater for children from the most poverty-stricken backgrounds in the area, including many orphans, who gather regularly for support, teaching, training and a good meal. All three centres lacked adequate water and sanitation facilities, and had expanded well beyond their capability of providing core services, meaning they were playing continuous catch-up. Plans were drawn up by the WATSAN Team for new toilets, changing rooms and water tanks for all three sites. Work on all three CDCs was completed in October 2016. 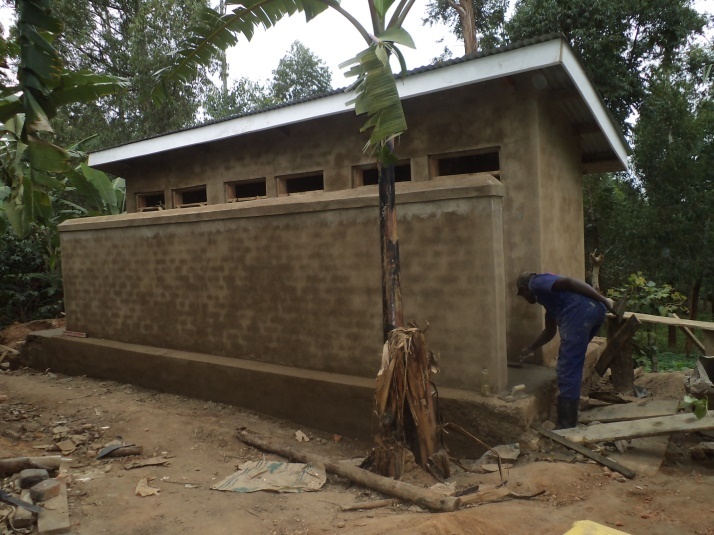 Each centre now has a 30m3 ferro-cement rainwater harvesting tank, a six-stance lined pit latrine for girls (see picture taken at Rwerere), and a two-stance latrine with a urinal for use by staff at each centre. As always with WATSAN projects, associated health and hygiene education activities were undertaken, in parallel with the construction work. A gravity flow scheme which provides 10 tapstands to serve 1615 people with first time improved water supply, integrated with sanitation facilities and health & hygiene education. Scheme largely funded by TearFund. Construction of this project was completed in April 2016 and commissioning and handover to the community took place on the 27th. of that month. New Water and Sanitation facilities to serve 500 pupils and staff, and the reconstruction of a spring source to be shared between some 250 people in the local community and the school. The picture shows WATSAN masons at work on a new Ecosan Toilet at this school in Oct. 2015. This scheme was completed in in June 2014, after four phases took place over a period of three years. It was built to serve a population of 7,650 people, including the pupils and students at two primary schools, two secondary schools and a polytechnic, four trading centres and a health centre, for the design period of 20 years. The total cost was some £137,500, which included the construction of two new sources, and a technically demanding renovation of the existing water supply line (spring protection, tank and pipeline construction in a ravine, high in the Kigezi hills, on a source which had previously been washed away by heavy rain). There is now some 20 kilometres of pipeline, some of it pre-existing from earlier schemes; two new storage tanks; and a total of 45 tapstands. We are grateful to TearFund for their strong support for this project over several years. The water supply at Burema School and associated sanitation facilities serve 1,328 people at the school and in the nearby trading centre. The facilities in the area were renovated at a cost of £27,250, including local contributions, mostly in kind, to the value of £7,850. The project consists of two roof catchment tanks, a five-stance Ventilated Improved Privy for students and a two-stance Ecosan toilet for staff, together with a substantial bathing shelter sufficient for all the girls at the school. A seepage well situated in the adjacent primary school was renovated, in lieu of an old borehole that had collapsed beyond repair. A dilapidated old spring in the nearby trading centre of Kyeijanga was been rebuilt as the final stage of this project for use by the whole community. This scheme again included education and training carried out in the community, with the underlying objective of promoting sustainability. As a result the pupils no longer have to walk miles to collect water, not even in the dry season, and the school is now thriving and enrolments have increased substantially.